My daughter, Lisa, recently sent me an article she had written, which first appeared in GOOD-Travel.org, from which I have selected excerpts below. “Lisa Baddock is a passionate advocate for sustainable travel and is fortunate enough to have travelled and worked with some inspiring operators who are setting great examples for the travel industry. The National Geographic Society defines citizen science as; ‘The practice of public participation and collaboration in scientific research to increase scientific knowledge.’ It means that ordinary people like you and I can contribute to global scientific knowledge without any hard-core qualifications. After all, scientific research is the essential first step towards solving some of the world’s biggest issues, from plastic pollution to climate change or the extinction of animal species. Scientific institutions will often seek collaboration from ‘citizens’ by reaching out to community organisations, schools or universities who can help capture data about a given topic on a voluntary basis. There are a lot of people out there who are passionate about spending time in nature as well as protecting it for the future. Citizen science is a great way for people to get their hands dirty and make a real, physical contribution towards a cause that they are passionate about. People do not simply leave these values and passions behind when they travel. In fact, it can be quite the opposite. When it comes to travel, an increasing number of people are looking for off-the-beaten-track experiences where they can learn something new, engage deeply and maybe even connect with a greater purpose. GOOD Travellers are also mindful of their travel footprint and are driven by a desire to leave a positive impact on the destinations they visit. I believe that citizen science is taking off in the travel space because there is a natural alignment of values and outcomes for everyone involved. Many natural areas require active monitoring, rehabilitation and conservation in order to protect wildlife for the future, especially in areas which have suffered from illegal mining, natural disasters, overhunting and more. All the while, the number of travellers seeking authentic experiences and a way to give back is growing. On top of that, the act of working together with local people and other travellers for a common goal is a great way to forge genuine connections that go beyond the transactional encounters that often occur in tourism. These scenarios create an opportunity for both locals and travellers to learn from each other, resulting in a two-way cultural exchange. I know it’s overstated, but it’s because it’s true – the people you meet while travelling can often have a bigger impact on the overall travel experience than the places you visit. Lastly, there’s no denying that it feels GOOD to give back when you travel. SeaTrek Sailing Adventures operate two traditional pinisi boats throughout the remote and wildlife-rich islands of eastern Indonesia. Operating in some of the most pristine aquatic environments in the world, the socially and environmentally minded adventure company is passionate about protecting our oceans from the global plastic crisis. 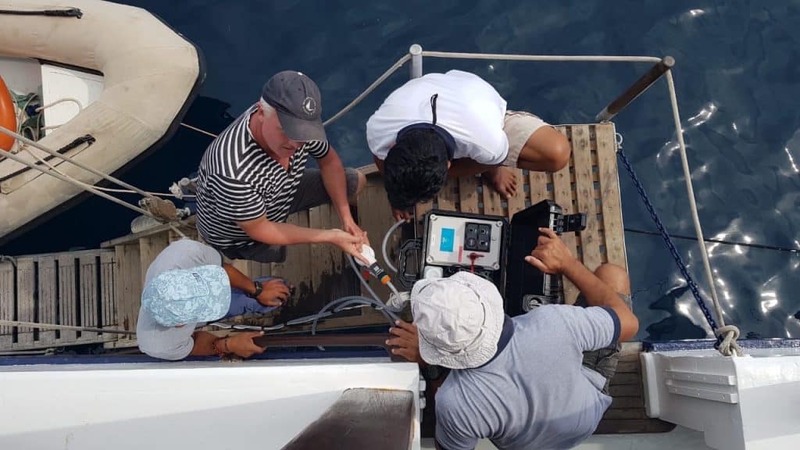 They recently launched a new citizen science initiative in collaboration with Indigo V Expeditions, where guests can help to collect, test and eliminate microplastics as they sail. ( attached photo). Perhaps this could motivate more of our local tourism operators to incorporate some ‘citizen science’.